There will be some number of debates between Mayor Parker and Ben Hall between now and Election Day. How many debates, and how many participants there will be in those debates, is itself a matter of debate. In a letter to [Mayor Annise] Parker this week, [Ben] Hall sought three debates after Labor Day on Sept. 2 but before the start of early voting, and another three leading up to Election Day on Nov. 5. 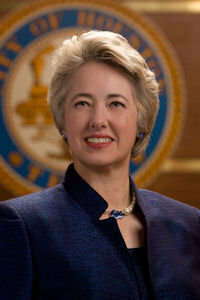 “Too much is at stake for us not to share our plans for Houston with her citizens,” Hall wrote. Hall campaign spokesman Mark Sanders cast Parker’s response as a win for the challenger. Davis said Sanders was “misconstruing” Parker’s comment to Hall at a Juneteenth parade, where Davis said the mayor told Hall she would not debate “just him,” intending to include other entrants. The other three candidates in the race spent less than $25,000 as of June 30. “If Rice University says they want to put on a debate or the Greater Houston Partnership says they want to put on a debate and they’ve got local media participation, well, it’s difficult for Parker to say, ‘Oh, I’m sorry, I don’t want to do it,’ ” Blakemore said. I think Blakemore gets this right. Sure, Parker and Hall could go the full Garland/Rooney route and put together their own traveling roadshow of Mayoral debates, but that’s usually not how these things work. Some number of organizations will want to sponsor debates. However many of them there are, it would look bad for either candidate to decline to participate. I suspect the final number will be two or three, but that’s just a guess. I do agree that one isn’t enough, and six is too many. There’s only so much material that can be reasonably covered in these debates, and after a certain point the questions start to get repeated or they become silly in an attempt to avoid repetition. On the other end, I agree with Texpatriate and Texas Leftist that the other activities Mayor Parker cites aren’t adequate substitutes for engaging her opposition, and that a lot of us thought it was bush league the way Rick Perry ducked debating Bill White at all in 2010. While it’s generally true that candidates that are leading have no great incentive to share the spotlight with those who hope to catch them, being the incumbent should mean being above that kind of game-playing. And personally, I don’t think she has anything to worry about. She has a strong record to defend, and Hall has yet to articulate any clear reason to vote her out, let alone what he himself would do as Mayor. Debating about debates eventually becomes its own issue. If I’m Mayor Parker, I’d rather talk about more interesting and substantive things than that. Texas Leftist also makes a point about it being better for any future political ambitions the Mayor may have to meet Hall head on, and I agree with that, too. The side issue of who gets to participate in these debates will be fun to watch. Normally, frontrunners aren’t terribly excited about having a large number of debate participants since that just means more people taking potshots at them. Here, though, Mayor Parker appears to be more willing to allow the fringe characters into the as-yet-unplanned debates than Hall is. I’m generally ambivalent on this point. On the one hand, in a democracy all voices deserve to be heard. On the other hand, it’s hard to see what any of the bit players will bring to the table, since none of them has done anything to indicate they are seriously engaging in the issues that would be debated. A Mayoral debate is likely to be a 60 to 90 minute affair. How much of that time do you want to be spent on people that don’t have anything constructive to say, and how much of it do you want spent on Annise Parker and Ben Hall? Now, any organization that wants to host a debate will have its own preferences on this and that’s fine, but if Hall and Parker have different visions then it becomes another obstacle to getting anything done. If it were up to me, I’d let one or maybe two debates be all comers, but I’d insist on their being at least one of just Parker and Hall. I guarantee, we’ll get more out of that one than the others. Campos has more on that. On a side note, I’m amused that the headline of the story was about Hall’s campaign “gathering steam” when the story was one part about the great debate debate and one part about the two new Republican campaign operatives he has coming in to replace two other Republican campaign operatives. Generally speaking, campaigns that have wholesale personnel changes midway through are not described as “gathering steam”. I will note that the new Hall team did something that the old one never did, which was send out email to the local bloggers with a copy of Hall’s letter to the Mayor containing his debate proposal; here’s a copy of it. I’m not egotistical enough to think that a handful of us Internet bloviators matter that much in the grand scheme of things, but I will point out that between us, we’ve written more about Hall and this race than the Chron has. If nothing else, you’d think a campaign might want to exert a little effort to ensure that their perspective is taken into account when we do our thing. My feelings about this campaign and the candidates aside, I’m glad to see that Team Hall has finally gotten around to doing that. Greg has more.